Again and again the data show that people of color in the U.S. are disproportionately, and systematically, stopped, frisked, arrested, and exposed to the use of force by police. Police departments and communities across the U.S. are struggling with these realities and with what has become a glaring divide in how Americans experience and relate to policing. This special collection includes research from nonprofits, foundations, and university based research centers, who have not only described and documented the issue but who also provide much-needed recommendations for addressing this chronic and tragic problem. 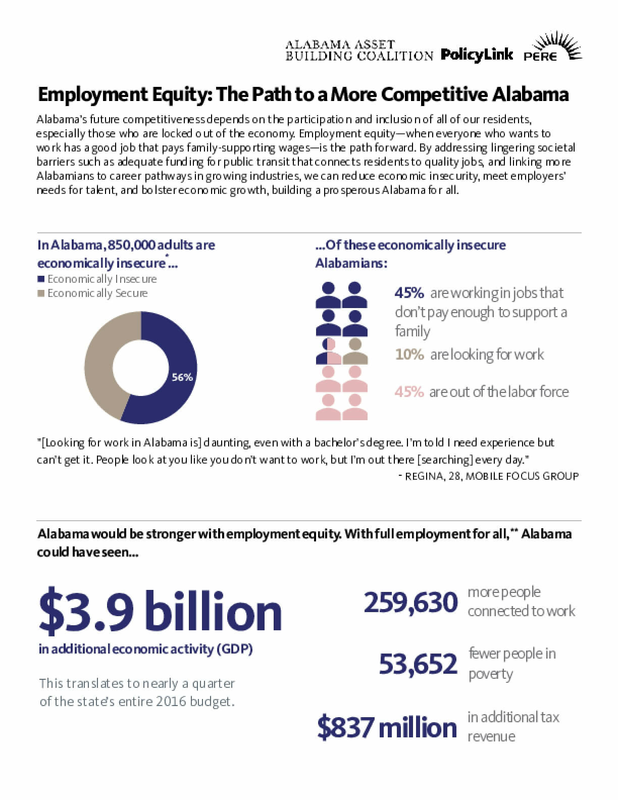 Alabama's future competitiveness depends on the participation and inclusion of all of our residents,especially those who are locked out of the economy. Employment equity—when everyone who wants to work has a good job that pays family-supporting wages—is the path forward. By addressing lingering societal barriers such as adequate funding for public transit that connects residents to quality jobs, and linking more Alabamians to career pathways in growing industries, we can reduce economic insecurity, meet employers' needs for talent, and bolster economic growth, building a prosperous Alabama for all. Across New York State tens of thousands of New Yorkers are held in city and county jails, not because they have been convicted of a crime, but because they cannot afford to pay for their release while awaiting trial. The harms of unaffordable cash bail are unequivocal: people lose their jobs, homes and families while detained. People also forfeit their rights to trial when pleading guilty in exchange for release. Yet little has been known about how many people across the state have been locked up because they did not have the means to pay bail, about the charges they faced or how long they were kept in jail. 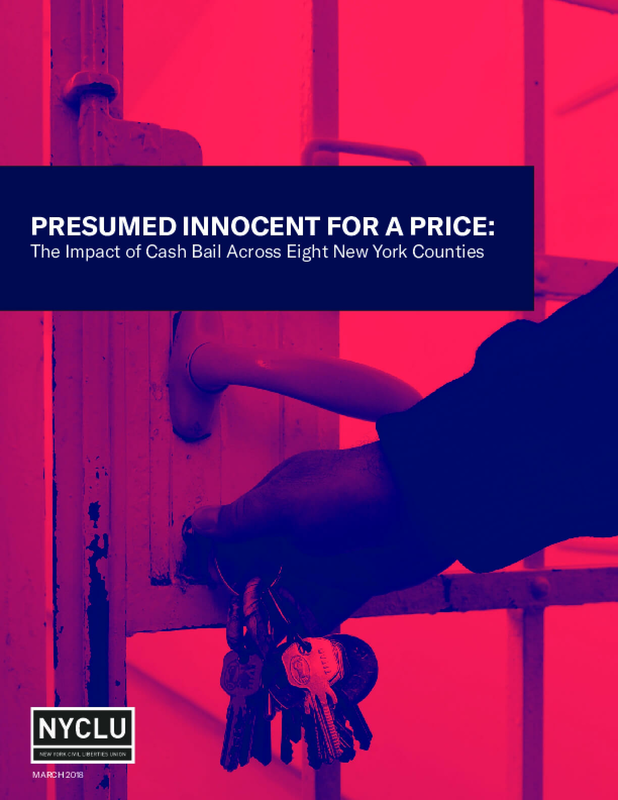 To better understand the impact of bail practices in New York, in 2015 the New York Civil Liberties Union sent Freedom of Information Law requests to a sample of eight small, medium and large counties across the state asking for five years of data. The information we received offers a stark glimpse into what New Yorkers have had to endure. This fact sheet, updated June 2017, provides a compilation of key developments in the criminal justice system over the past several decades. 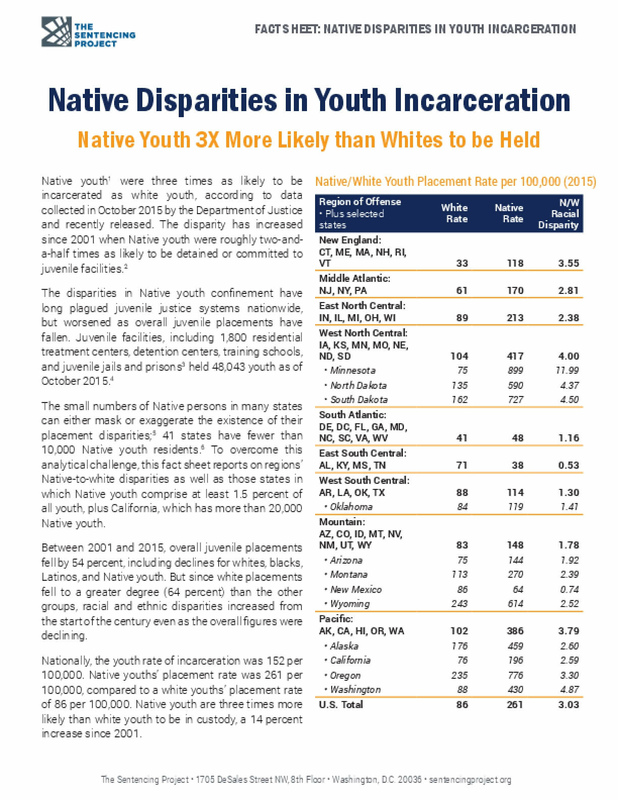 Native youth were three times as likely to be incarcerated as white youth, according to data collected in October 2015 by the Department of Justice and recently released. The disparity has increased since 2001 when Native youth were roughly two-and-a-half times as likely to be detained or committed to juvenile facilities. 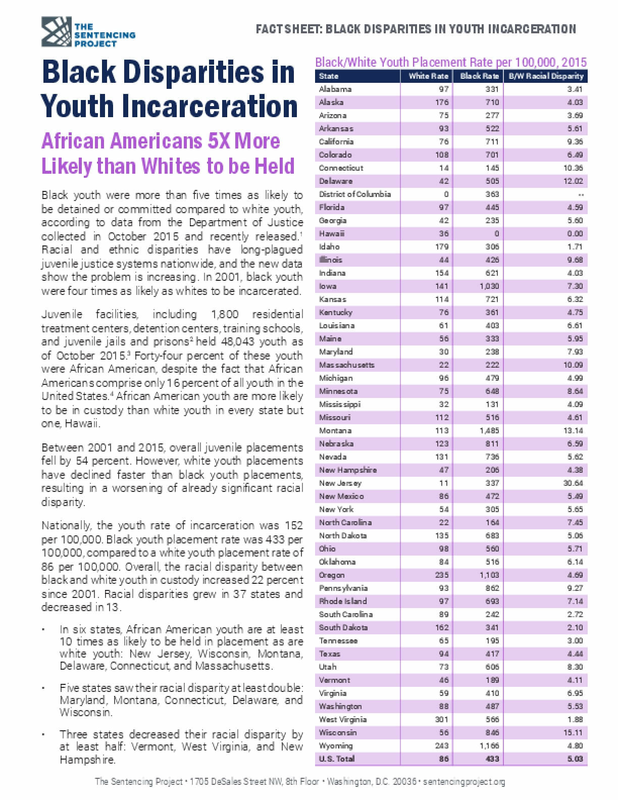 Despite long-term declines in youth incarceration, the disparity at which black and white youth are held in juvenile facilities has grown. As of 2015, African American youth were five times as likely as white youth to be detained or committed to youth facilities. 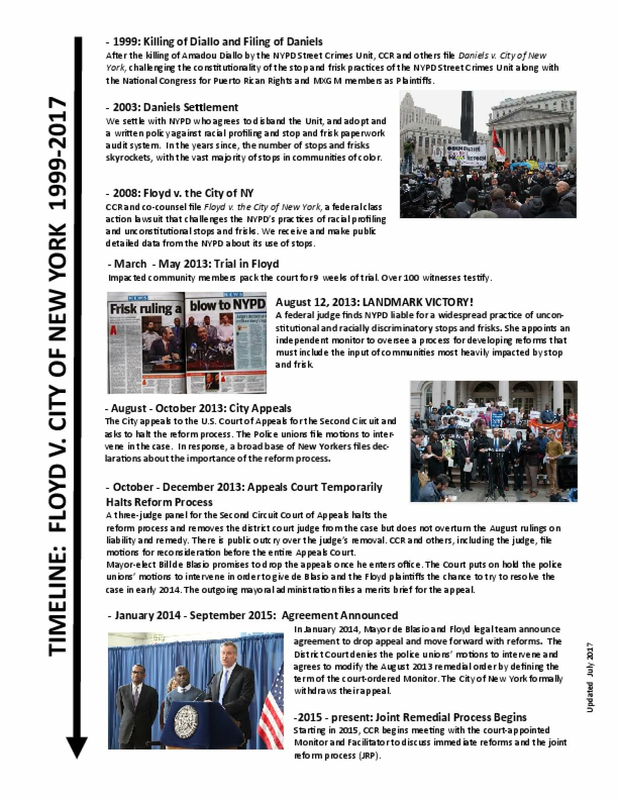 In August 2013, a federal judge found that the New York Police Department (NYPD) had engaged in a widespread practice of unconstitutional and racially discriminatory stops and frisks and ordered a collaborative, joint remedial process (JRP) to develop a set of reforms that will help bring the NYPD's stop-and-frisk practices into compliance with the Constitution. The judge highlighted the importance of getting this input, writing at the time, "No amount of legal or policing expertise can replace a community's understanding of the likely practical consequences of reforms in terms of both liberty and safety." The JRP ensures that communities who have been directly affected by these practices will have direct input into shaping the future of stop and frisk in New York. The JRP was envisioned to solicit ideas for additional reforms from communities most impacted by stops and frisks. In addition to community stakeholders, the process will involve the City, members of law enforcement, local elected officials, organizations with expertise in policing and criminal justice attorneys representing the plaintiffs. This process echoes a similar process successfully implemented in Cincinnati, Ohio over a decade ago to address systemic abusive and biased policing practices. Guiding this process is the court-appointed Facilitator, Hon. Ariel Belen. 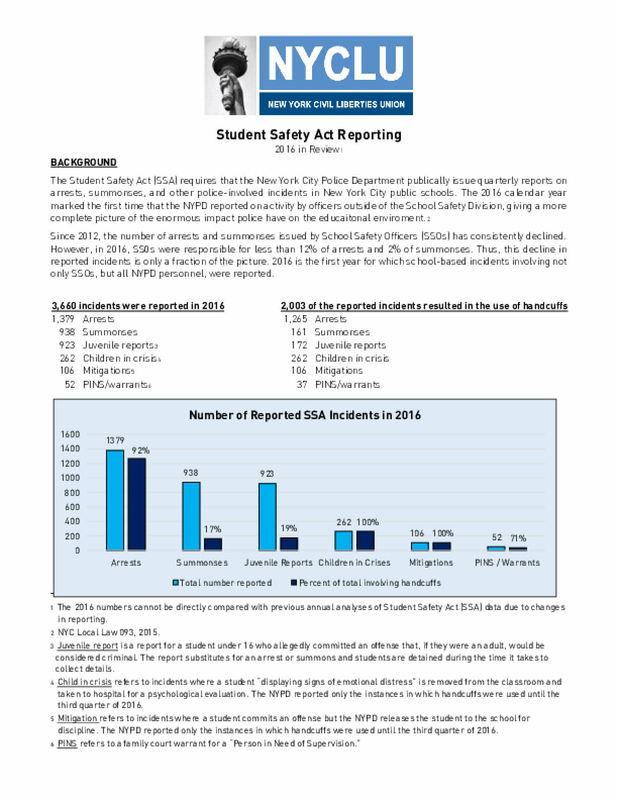 The Student Safety Act (SSA) requires that the New York City Police Department publically issue quarterly reports on arrests, summonses, and other police-involved incidents in New York City public schools. The 2016 calendar year marked the first time that the NYPD reported on activity by officers outside of the School Safety Division, giving a more complete picture of the enormous impact police have on the educational environment. Since 2012, the number of arrests and summonses issued by School Safety Officers (SSOs) has consistently declined. However, in 2016, SS0s were responsible for less than 12% of arrests and 2% of summonses. Thus, this decline in reported incidents is only a fraction of the picture. 2016 is the first year for which school-based incidents involving not only SSOs, but all NYPD personnel, were reported. 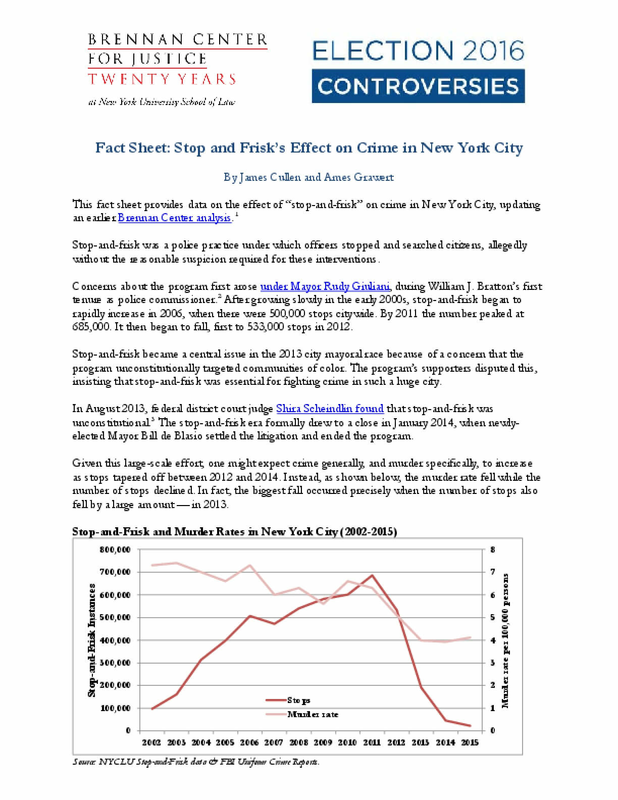 This fact sheet provides data on the effect of "stop-and-frisk" on crime in New York City, updating an earlier Brennan Center analysis. Stop-and-frisk was a police practice under which officers stopped and searched citizens, allegedly without the reasonable suspicion required for these interventions. Concerns about the program first arose under Mayor Rudy Giuliani, during William J. Bratton's first tenure as police commissioner. After growing slowly in the early 2000s, stop-and-frisk began to rapidly increase in 2006, when there were 500,000 stops citywide. By 2011 the number peaked at 685,000. It then began to fall, first to 533,000 stops in 2012. Stop-and-frisk became a central issue in the 2013 city mayoral race because of a concern that the program unconstitutionally targeted communities of color. The program's supporters disputed this, insisting that stop-and-frisk was essential for fighting crime in such a huge city. In August 2013, federal district court judge Shira Scheindlin found that stop-and-frisk was unconstitutional. The stop-and-frisk era formally drew to a close in January 2014, when newly-elected Mayor Bill de Blasio settled the litigation and ended the program. Given this large-scale effort, one might expect crime generally, and murder specifically, to increase as stops tapered off between 2012 and 2014. Instead, as shown below, the murder rate fell while the number of stops declined. In fact, the biggest fall occurred precisely when the number of stops also fell by a large amount — in 2013. 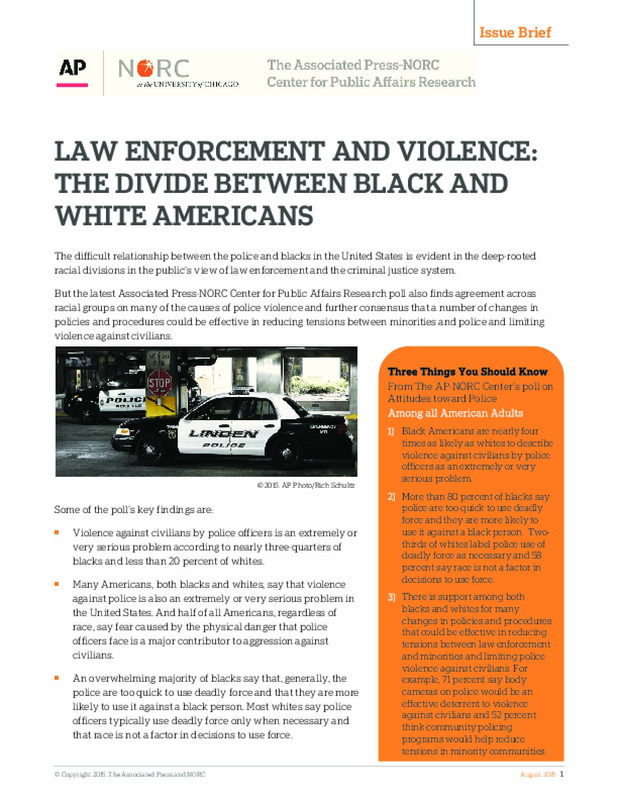 This document summarizes the findings of the AP-NORC Center's survey regarding race and policing. Some of the key findings include: 1) Black Americans are nearly four times as likely as whites to describe violence against civilians by police officers as an extremely or very serious problem. 2) More than 80 percent of blacks say police are too quick to use deadly force and they are more likely to use it against a black person. Two-thirds of whites label police use of deadly force as necessary and 58 percent say race is not a factor in decisions to use force. 3) There is support among both blacks and whites for many changes in policies and procedures that could be effective in reducing tensions between law enforcement and minorities and limiting police violence against civilians. For example, 71 percent say body cameras on police would be an effective deterrent to violence against civilians and 52 percent think community policing programs would help reduce tensions in minority communities. Since 9/11, (actual or perceived) Muslims, Arabs and South Asians have been viewed by law enforcement as a potential threat on no basis other than religion, casting guilt on all members of that faith. 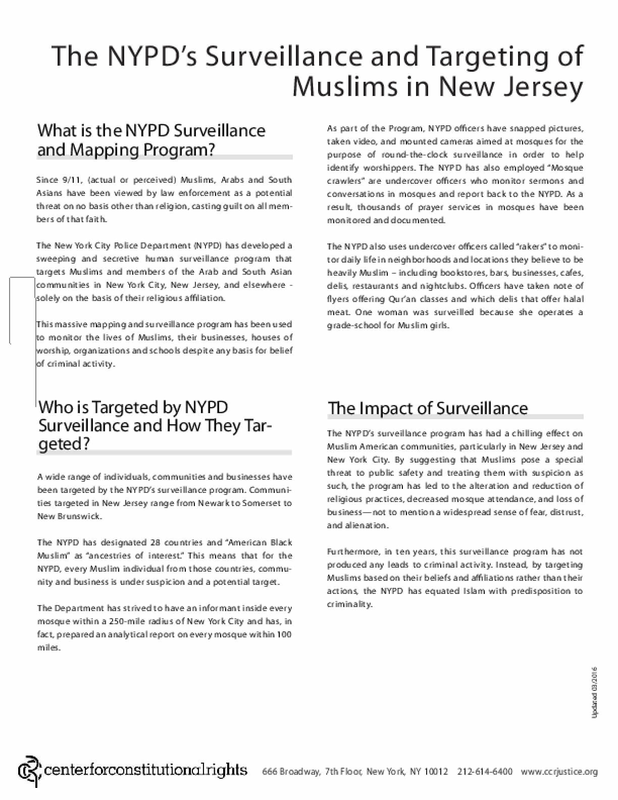 The New York City Police Department (NYPD) has developed a sweeping and secretive human surveillance program that targets Muslims and members of the Arab and South Asian communities in New York City, New Jersey, and elsewhere – solely on the basis of their religious affiliation. This massive mapping and surveillance program has been used to monitor the lives of Muslims, their businesses, houses of worship, organizations and schools – despite any basis for belief of criminal activity.